Don’t get stuck with low battery power just as you’re getting on the tube or setting off sightseeing around the city without a charging cable. The TeckNet PowerEx 1 Power Bank with it’s built-In charging cable can effortlessly recharge your smartphone, tablet, or other smart device quickly and conveniently when you need it most – anywhere. The built-in Micro USB cable simply pulls out from the PowerEx 1 to quickly charge-up the vast majority of Android and Windows smartphones. Pull the micro USB cable away from the side of the Power Bank and plug it into your device’s micro USB port. Charging starts automatically and after charging is complete, the power bank automatically turns off. To recharge the PowerEx 1, simply pull out USB cable from the side of the PowerEx and plug into your computer’s USB or a wall socket USB. The PowerEx 1 will automatically begin recharging. The PowerEx 1 could’t be simpler to use, just plug into a device to automatically start charging – no need to press any buttons. 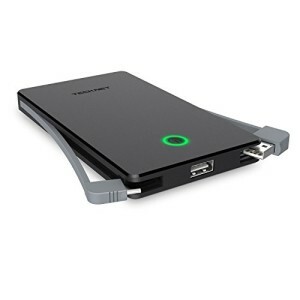 The PowerEx 1 has 2 USB outputs with a total output of 3.4A allowing you to recharge two devices at once. The Duo-Charge function enables the PowerEx 1 to be recharged while it charges-up a connected device such as a smartphone or tablet.